I’ve always found it odd how back in the day people would settle a feud or debt or any matter with a duel. When you know that two men will be face to face and only one will survive – ahh it sounds horrific and terrifying. It’s 1860 in St Petersburg, Yaklov is a retired officer. Now basically you could call him an assassin because he is hired by Counts, Princes and other members of Russian nobility to take their place in duels. Known to always kill his opponent – as many years back he was near to dying due to a punishment inflicted on him by other soldiers ( will go into detail later). He was miraculously healed by a shaman who confessed that he would never die. Which turned out to be true as Yaklov always defeated his opponent. It is revealed to Yaklov that all the recent duels he was hired for were by Count Beklemishev – who happens to be a bitter, selfish and sadistic man. He is in love with Princess Martha Tuchkova whose brother Prince Tuchkova does not wish to give his sister’s hand in marriage to that brute. What does the evil count do? Makes sure Yaklov’s next duel is with the young Prince. Princess Martha Tuchkova traces Yaklov and implores him to save her brother, he disagrees at first only to shoot the man next to the prince who had also been involved in the plot to kill him. Count Beklemishev is infuriated. What many do not know is he is a little frightened of Yaklov. However he manages to conceal it extremely well. As Yaklov & Princess Martha grow closer, Count Beklemishev plans an assassination attempt on her brother & Yaklov as they travel in the same carriage. Sadly, he is succesful in killing the prince yet Yaklov manages to survive once more. Oh , and there’s more to the story. Apparently the count and Yaklov had a past in which they had still despised one another. Declaring Yaklov be stripped of his nobility ( I can’t remember the exact reason as the Russian subtitles were a little difficult to understand in that scene) he made sure he was beaten and thrown into the sea – hence he was found by the shaman. 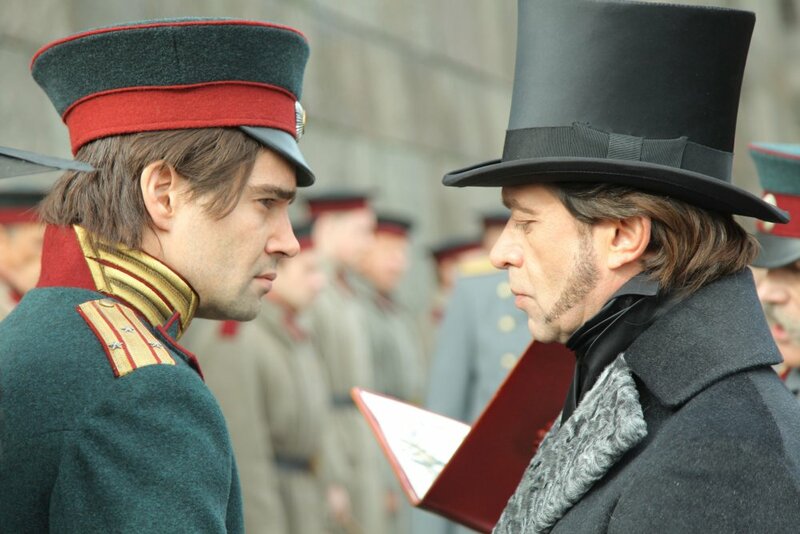 He challenges Count Beklemishev to a duel – at first Count Beklemishev disagrees claiming Yaklov is not a noble. That plan is cut short as another young nobel lies declaring Yaklov his brother and the duel commences. What happens next, I don’t want to reveal to you all because I feel you should watch the movie. However, if you still want to know you can ask me and I shall tell you! Basically the message to this movie is, just look at how many lives were lost. And for what? Honour, glory, the family name or a bout of rage? The devastating thing is, it still happens to this day. Not in the form of duels but the easy access to guns which are far more advanced than the early years. Then there’s racism which creates violence, religious intolerance & terrorism. Just so much death. One should put the hate aside and think about what they are doing before going into a fit of rage and hurting another who most definitely has a family.We should learn from this movie to not let ego overpower our conscience and most of all – learn to forgive!